A guy walked up to my husband and asked him if the bike out front was his. While this man was a total stranger to my husband, they began to talk bikes with the ease of long time friends. What’s the big deal you ask me? My husband is not even a smidgen like me, and making conversation with a complete stranger is not something he prefers to do. He’s as far introverted as I am extroverted. We are polar opposites in this area. The fact he was not only talking, but interested in the conversation, laughing, and asking questions of this guy made ME smile. It’s a side of him I love to see in action. 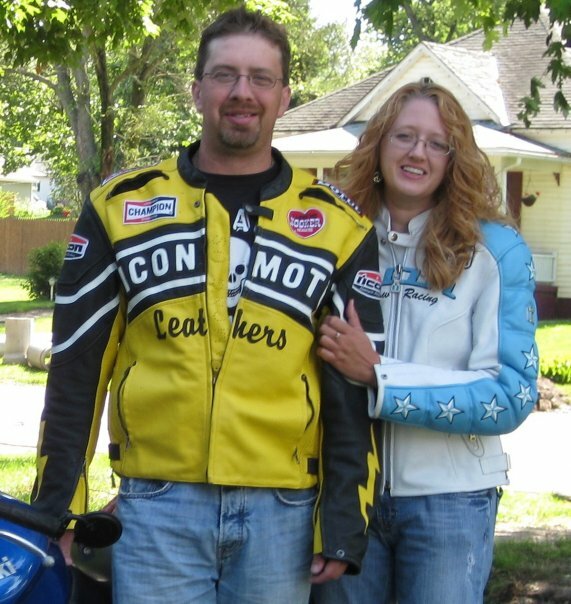 Bikes – meaning MOTORcycles, not BIcycles – make my husband come alive. When he pushes his bike out of the garage, zips up his leather jacket, straps on his helmet, and takes off, he’s a whole different person than the one who climbs in beside me in the van and drives off. I love to see my husband fully alive. His eyes are vibrant blue, with crinkles in the corners, and he grins a sideways smile and stands with purpose. He’s a man who is fully in the moment, participating in life, not reacting to it. I didn’t know this man existed till we’d been married for years. He began dreaming of owning his own bike long before he shared it with me. When he finally did, he was sure I’d shoot it down. 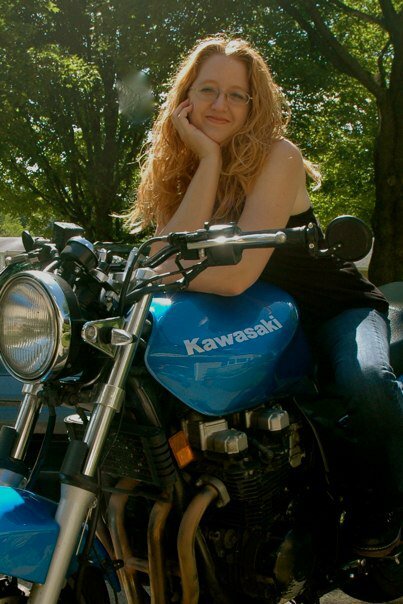 I’d been known to say there was no way I ever wanted someone I loved on a bike, EVER. I remember the day he first spoke his desire and God silenced my lips. I shocked myself by hearing him out and telling him that I fully supported any dream he was that passionate about. Then we agreed to pray over it. If God could find a way to deliver the means or ways to go about getting a bike, then we’d know it was what we should do. When the opportunity that seemed perfect came about later that winter, after about 6 months of prayer, my husband got his first bike. It was an older bike that had been totaled out after an accident. A buddy gave it to him when he got a new one and they fixed it back to riding condition after long hours of labor and even machining parts for it in some cases. By late spring it was ready to go. He’d taken safety riding classes and learned the basics… but now it was time for rubber to meet the road, for real. Derek came alive in a way I cant even put words to that first spring and summer while riding the backroads on that old Kawasaki. I wanted to understand his passion. So again, I called upon God. I asked that He bless me with eyes to see what my husband saw when he was on that bike. I wanted to feel what God lit in his heart when he was out on the open road. I wanted to know what made him tick. God blessed me with a yes answer to my requests and then some. The first time I ever got on the back of the bike with him, I imagined I’d feel pure terror as the bike accelerated and took up speed. Instead, I felt the rush of freedom like I’d never felt it before. It was like flying. The wind didn’t noiselessly toss the leaves around outside a car window… it swirled, and pulled, tugging and whipping at my clothes in response to my pushing against it, conquering the resistance of motion. The air on my skin was invigorating. Hunched down with my chest wrapped around his back, arms hugging him tight, we moved together as one. Scripture flowed through my mind and I heard God wordlessly knitting my heart to my husbands as repeated, “a man will leave his father and mother and be united to his wife, and they will become one flesh.” Gen 2:24. It meant a lot to me then, because both of us had had trouble in our early marriage in learning to “leave and cleave”. I can honestly say, that first ride was more than amazing. It was spiritual. I fell in love with riding, and I fell in love with the closeness it brings any two riders who move in time to the turns and angles of the road ahead. There are no words spoken on rides, just the rush of the bike down the road, the intense closeness of God that is so powerful it defies words. A girlfriend said to me, “I’d NEVER let my husband have a bike.” It was in response to my sharing our bike trip to Indy to watch the MotoGP races a couple years back. I kept my comment to myself, but I quietly realized I’d never make him get rid of one. Never. Not even if it meant he’d be here less time with me. That’s right… the risk of loosing him is worth the “risk” of keeping him. Hear me out… If I had to choose between a man who was truly ALIVE while he was living with me – happy and doing what he loves, and a man who was safely LIVING, and yet obviously quite dead inside… well, I can honestly say I have thought and weighed this many times over and I’d choose risking it and being alive over and over again, every time. Yes, even now while shedding tears for my friend’s loss. Really – this isn’t all that different than someone who takes up skydiving in their spare time as a hobby, learning to fly planes, rock climbing, backpacking in the wilderness, or any other NON-safe, sport. Why do people pursue something passionately? Safe or not safe? Take ANYTHING… Think here with me? They pursue it because it gives them life. It makes them tick. It makes them come alive inside. For me? It’s writing and theater. I have gone years without being on a stage, and honestly, a little bit of me has died out bit by bit. My flame that burns hot in my soul only is awakened when I am given a chance to pursue the things that God gifted me with, and I only can hear HIS voice speaking clearly when I am soaring down my own roadway – racing with the adrenaline that God chooses to speak to me through. It comes out in my writing and in my performing. I am so incredibly blessed by these two giftings. My husband knows this and last week he handed me a postcard with a listing for auditions for “It’s a Wonderful Life” down at the local theater and I did a double take when he said a simple, “You should go,” urging and left it at that. I asked him later on if he really meant it and he shrugged and said, “if you want to, yeah.” With that, he’d given me permission to be alive again. There are a TON of reasons why I shouldn’t go, I told myself. None were ones I wanted to listen to. So I went. It was by far the best three hours of the last 2 years of my life. I didn’t even care if I got a part. I had proved I still “got it” to myself, and I knew I “COULD” if I wanted to. The fire was still there. So that said… Is if fair for me to say to my husband to choose something safe, so I can feel better about how God chooses to talk to him? I don’t have to understand why God chooses to speak to my husband’s inner core by climbing on a bike. That’s not my job. My job is to support whatever God chose to do in him, how he chooses to use him, and to believe that He has a purpose for that. Men fly all over the country on business trips, travel numerous miles down commuting highways, and criss cross the globe in business and in pursuit of providing for their families and pursuing their passions in life, and in following the giftings of their hearts. My husband works ten miles from home and loves to commute those miles three seasons of the year via his motorcycle. The odds are against us all – in reality. Accidents happen. Period. There is no way to know when or how. But to live in fear of the “what if’s” in life is to live dead. Find what makes you alive inside and begin to live. If you are not living while you are alive, what’s the point? Truly? You might as well be a fatality counted amongst the tragic accidents of lives taken from this earth… for, frankly, you are far from living a life that will be counted as one worth being missed if one day you suddenly weren’t here the next. And my prayer for you, Joyce, and to Tom’s family, is that I hope you smile with joy as you see the picture of him in front of his new bike. It was not the one that was to be his fateful demise and take his life. It was the one he road to heaven, having dreamed about owning for so long. He would have been riding that day anyway, if he had wanted to. Accidents happen, and they happen to really good people. I pray you find peace and can begin to smile again. Tom would want you to. He would. Thanks a lot – and I am going to follow your link now. Greatly appreciate the feedback and your stopping by. You deserve to remember the joys, happiness, and life. Soooo much.